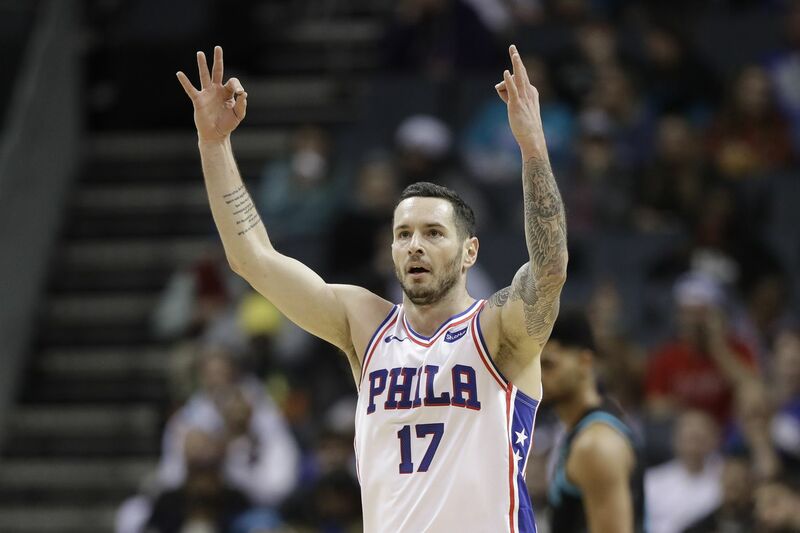 JJ Redick had 27 points in the Sixers win on Tuesday night in Charlotte, which was part of a $57,000 victory for a sports bettor at the South Philly turf club. A customer at the Parx’ turf club in South Philly hit an astounding 15-leg parlay on Tuesday night and he has JJ Redick (among many others) to thank for it. The unidentified gambler hit all six NBA games, two college games and a hockey game. He also was on the correct side of of all six NBA over/unders. The bettor’s $25 wager paid out $57,146.40 and is the largest hit for a sports bet at a Parx location. Sure hope he tipped the teller. South Philly has had sports betting since Jan. 15. Parx’ flagship casino in Bensalem opened its 'book on Jan. 8. Another turf club, in Oaks, Pa., started taking sports last week. Matthew Cullen, Parx’ senior vice president of interactive gaming and sports channeled his inner Hyman Roth when asked about the loss. A $25 wager paid out $57,146.40. The winning bettor picked the Sixers to beat the Hornets on Tuesday and for the game to go over 223 points. JJ Redick led the way with 27 points, 10 rebounds and eight assists -- nearly recording his first career triple-double. But it was D’Angelo Russell, who was the real hero of the night for our guy. Here’s a look at his wagers. » Fairleigh Dickinson money line. FDU trailed Prairie View by 13 in the second half before rallying for the 82-76 win in the first NCAA Tournament game of 2019. » Creighton -3. The BlueJays led throughout and ousted Loyola-Chicago, a Final Four team in last year’s NCAA Tournament, from the NIT with a 70-61 win. So much for this being the “No Interest Tournament." » Capitals money line. Washington did not get caught looking ahead and took care of New Jersey, 4-1. The Capitals, on Wednesday, lost in overtime to Tampa Bay. » Sixers money line and over 223.5 points. Charlotte had the ball with eight seconds left and a chance to win or send it to overtime. The Sixers held on for the 118-114 win. » Milwaukee money line and under 230.5, This should have told our guy that he was on to something. The Bucks led 99-84 after three quarters, a pace of 244 points that would have blown away his under play. The teams scored just 33 points in the fourth (Lakers, 17-16) and his Bucks and under play hit with Milwaukee’s 115-101 win. LeBron James (groin) and Giannis Antetokounmpo (ankle) sitting out didn’t hurt, either. » Warriors money line and under 230.5 points. Golden State won at Minnesota, 117-107. They had 39 assists on their 44 field goals. Yikes. » Clippers money line and over 219.5. The Clippers had a 17-point lead in the fourth quarter that was cut to three with 33 seconds left in the 115-109 win. The over didn’t hit until the final minute, as well. » Houston money line and under 232.5. The Rockets won 121-105, holding host Atlanta to just 47 points in the first half. (The Nets - above - scored 45 in the fourth quarter alone.) Eight of the last nine Rockets games had gone under prior to Wednesday night. » Brooklyn +3.5 and over 232.5. This was the most unlikely win. The Nets trailed Sacramento by 28 late in the third before a furious fourth-quarter rally was capped off by Rondae Hollis-Jefferson’s bucket with .8 seconds left. D’Angelo Russell scored 27 of his career-high 44 points in the fourth. The Nets won 123-121 despite allowing a 20-0 run in the third quarter. Unreal. ... And then D'Angelo Russell took over. Daily News/Inquirer handicapper Vegas Vic’s selections for Thursday’s NCAA Tournament games. Double V is gonna take a look at Nevada -2 points over Florida. Size MATTERS! The Wolfpack are very, very imposing. The starting five are all 6′7″ and taller, which will be a YUGE advantage over the smaller Gators. Another advantage is head coach Eric Musselman, son of Bill. Muss has been only magnificent since putting down roots in Reno. He posted a 24-14 record in his first year, then 28-7, 29-8 and 29-4 this season. My calculator tells me that’s 110-33, and my brain tells me, pretty sweet. The Wolfpack had some spread issues at the end of the season, covering only one of eight, but they’re all healthy, and ready to rumble. Just take a quick check of Nevada’s Jordan Caroline before you open the wallet. He missed the game against San Diego State in the MWC tourney, but all reports say he’s good to go this evening (6:50 p.m. start). And if you’re looking for a two team 6-point teaser, gotcha. Take New Mexico State from +5.5 to +11.5 points against Auburn, then grab Northeastern, and take 'em from +7 to +13 points against Kansas. Vic is not dropping any cash, but will be checking in to the South Region in Hartford for the Villanova/St. Mary’s game. 'Nova had a fabulous run through the Big East Tournament, but the Wildcats didn’t make anyone money. They covered just one of three at Madison Square Garden and only three of the last nine to close the season. And even more disturbing is only one cover in the last seven road games. OUCH! St. Mary’s won the West Coast Conference crown with a stunning 60-47 victory over a very talented Gonzaga team. And watch out for a little D in this game, because the Gaels have gone under in eight of the last nine. The 'Cats overall spread log sits at 20-14, 11-8 on the road and 15-14 as a favorite. Mary’s overall spread mark is 19-14, 8-8 on the road and 2-4 as an underdog. For the total players, 'Nova has gone over 14 times, Under 19 and pushed once, while the Gaels have gone over 15 times and under 18.